If you’ve ever looked at your diary, notebook, sticky notes and Inbox in the middle of a busy sales period and thought, “This isn’t working,” you’re not alone. But that’s only part of it. It’s important to remember that your sales stages have to mirror the buying stages of your prospects or customers. You’ll see I included Proposal Sent in the stages – that’s because typically one has to submit a fully costed proposal to customers, as it’s a requirement in their “buying cycle.” Everyone’s buying cycle is different, but trust me, it helps to have a good idea of your customers and how they like to buy. The magic question is: How many deals do you need to add to your pipeline to make your objectives? It would be great to win every deal you’ve submitted a proposal for, but this doesn’t happen. If you know how many deals you win on average, you can easily calculate the number of deals you need in each of the early stages. We explain more about this in a short video blog. If you calculate your numbers, you’ll be able to see how your pipeline looks and what number of deals you need to be adding to the top of the pipeline to reach your goals. 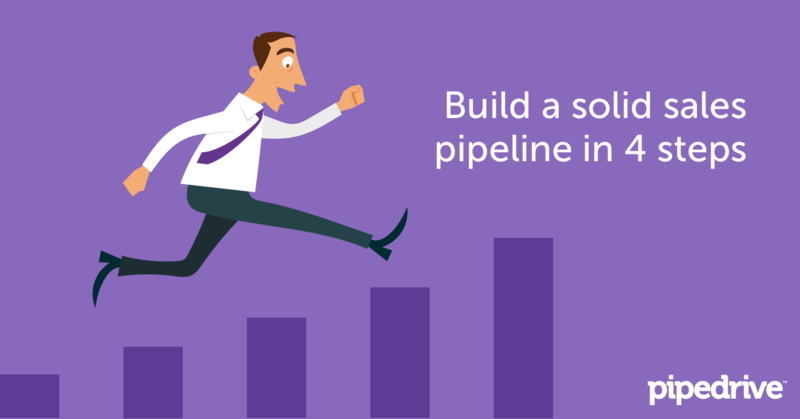 Once you have your pipeline stages laid out, you have to keep deals on track. When you’re moving your deals stage-to-stage what are the factors or variables that will help you advance your deal? It could be sending a written a proposal, identifying the stakeholders or it could be budget approval – there’s an event at each stage that moves the deal along. It’s a good habit to set yourself objectives for these key events. You can control the activities to keep the pipeline moving, not the results. Setting objectives for yourself that relate to how many proposals you send and new prospect calls you make per day is the best guarantee that your deal flow doesn’t stall. Activities that add new deals to your pipeline need to be part of your routine – daily or, depending on your business, weekly. Back in my days of active sales I liked to start every day with a cup of coffee and that’s when I did calling and prospecting to find new deals. It worked for me because it was a habit. You might have to try out different ideas before you find a routine that suits you – a particular time of day, a day of the week or a regular slot in your diary when you can really focus on putting deals into the pipeline. When you keep that focus and habit for finding new targets you don’t need to worry about your sales pipeline. Pro Tip No. 2: Use good sales management software. I’m confident Pipedrive will help anyone close more deals. If you follow these ideas to build a sales pipeline, you’ll like the results. In summary, set up your stages and do what it takes to move deals from one stage to the next; then, adopt a healthy approach to your pipeline building activities. It will help you meet your numbers. And that, in turn, will help you build a successful business. Fifteen-plus years of sales pipeline know-how condensed into one email course.